Appointments are 60 or 90 minutes including a consultation and aftercare. Please state a preferred time when booking. The consultation will take a little longer on your first appointment. Information supplied is strictly confidential. Your modesty is respected at all times. On arrival we will discuss what you want from your massage, any injuries, ailments or just a need to de-stress. If it is your first appointment this will take a while longer. I will leave the room to wash my hands, whilst you undress. How much you remove will be up to you and whatever you are comfortable with. Your modesty is my priority. 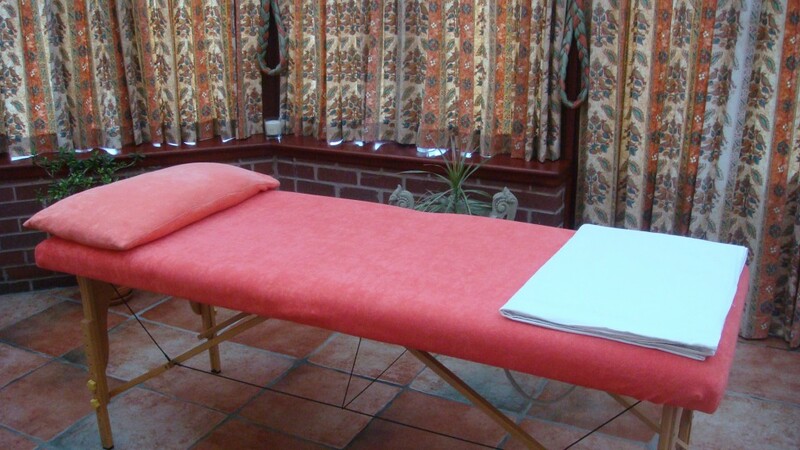 A warm brushed cotton sheet is provided for your comfort and coverage whilst on to massage table. I will massage one area at a time, the rest of your body remains covered throughout. I use a Hypoallergenic Massage Gel, which is ‘nut free’. At the end of the massage, I will leave you to relax for a short time while I go and wash my hands. When you are dressed I will return and we can then discuss how you feel after the massage. A glass of water will be provided for you. I will then advise after care for you personally, but please also read about ‘After Care’ below. Payment will then be made and any further appointments booked. Drink plenty of water for the next 24 hours, as this will help flush out toxins that may have been released from tissues during massage treatment. Take it easy for the rest of the day. This will help your body carry out its own healing process. Avoid alcohol or any strong stimulants for a minimum of 12 hours following treatment. This is to avoid dehydration. If possible only light meals should be taken for the first 24 hours after treatment.